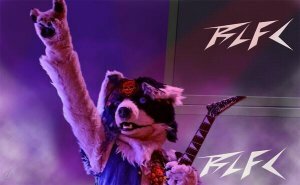 On March 28-30, 2014, fur met hair band style, for the radical 1980’s-themed Biggest Little Fur Con. In 2013, I really enjoyed attending the first BLFC in Reno, NV. It had a healthy attendance of 704. At the second BLFC, attendance shot up to 1442 (including 465 costumers in the parade). It broke the 2nd, 3rd, AND 4th year furry convention attendance record. With 105% growth, it became the 7th largest con by attendance at this time. Whoah, dude! This is a sign of burgeoning subculture. It was a super positive experience. I loved dancing with the 80’s theme, representing it in costume, and playing retro video games in a nicely hooked up game room. (I heard high praise from another con’s game room organizer.) My favorite part was fursuiters on go-karts. I’d love to give a well-rounded review about the programming, the hard work of the organizers, and charity benefit results. But I didn’t actually DO a lot more than bounce around like an escapee from the Bubble Bobble machine. So… What was your favorite part, fuzzies? My friend Dane and I were talking about a dealer booth that had something to do with a “Naughty Dragon”. “’Hummm… Postmodern. Triple-Post-modern.’” I said. Their case was full of sculpted items that caused major giggles. And that was just from their salesperson! It was Dane’s first-time trip to a fur con. We were former neighbors who met through San Francisco’s nerd/hacker community. He was enthusiastic to be there, and entertained by everything. He was experienced with going to Burning Man, but a newcomer to this furry thing. I enjoyed inviting him and hearing his reactions. In Part 2, I’ll share more chatting we did.